It’s quite amazing to me how much insight the seemingly insignificant objects and circumstances of our lives have to offer us if we’ll just stop for a moment to look and listen. Like word pictures on a life size screen they patiently wait for us to focus on them to impart to us their message. Last week I gathered together the remnants of the partitions that I had moved from the ministry center and used them to construct a playhouse for my daughter. It worked out nicely because I also had several bundles of shingles that had been left sitting in the yard by my brother in-law to use for the roof and this was the proper motivator for me to deal with them. I saw these real grapevines growing and so I snapped this shot to use for comparison. They look as if they’ve been through a hot summer. Most of the leaves have wilted and fallen off allowing a better view of the delicious fruit they’ve given their all to produce. All of this vine viewing caused me to take a serious look at my own spiritual life. Is my Christian life just about appearances? Do I really have a connection to the true vine? Given the choice,would I rather not “get real” if it meant that I couldn’t remain unchanged and indifferent to my environment? Am I really so superficial that I’d prefer to be something with practically no value primarily because it required nothing of me other than to go through the motions? 1I am the true vine, and my Father is the husbandman. 5I am the vine, ye are the branches: He that abideth in me, and I in him, the same bringeth forth much fruit: for without me ye can do nothing. My recent evangelistic/ministerial efforts fell pretty far short of what my hopes were for them but I feel as though I learned many valuable lessons in the process. I’m still very interested in seeing my vision of a ministry center happen, I think it’s a great idea that could produce a lot of fruit! Basically the idea is for the church to connect with people by providing assistance with many of the common issues that are causing both the churched and unchurched so many problems today. It’s more than just mentoring, it’s free help with things like exercise classes and health maintainence information, diet and food issues, money stewardship, family skills and counseling, substance abuse and addiction support meetings. All centered around the practical application of biblical principles as the solution to every need! Why not put it all under one roof and make it convenient and organized so that people could be more easily helped? There would be paid teaching/training positions as well as a lot of volunteer work done by members of local congregations which would provide their members with great opportunities to stir up the gifts within them as they serve God and their communities! According to the statistics I’ve read put out by The Barna Group we’re losing the battle for souls in this nation. If I were to speculate as to why that is I’d have to say that it seems as though the church has gotten a reputation for being about all of the wrong things. We’re hypocrites, child molesters, thieves and con men in peoples eye’s who it seems really only care about one thing and that’s money! What better way can you think of to let people know what we’re actually “for” ? We as the church must attempt to reach everyone that’s “wrestling” with all of the weapons that have been formed against them by the powers and principalities of our enemy. The only way that we can lose is If we continue to do nothing but sit back and wait for the lost to come to us instead of going to them. Instead we should be open compelled to do whatever it takes to share the good news of salvation and deliverance with everyone who’s life is plagued by the effects of sin! The Father gave us the resources to build multi-million dollar churches, He left us with His Holy Spirit to help us, and He sent us Jesus who defeated the Devil for us so that none of these weapons can prosper against us unless we allow them! What will we as the church do with all of that? I’m aware that many people have a problem with the notion of an omnipotent, omnipresent, God who loves each of us so much that He’s concerned with the circumstances of our individual lives. Perhaps even more mind blowing to them is the further contention that He would put His Holy Spirit in the midst of our circumstances with the intent of working out the details of His great purpose through each one of us. That’s precisely the reason I’ve got to tell this story, and while I know that there are some who won’t share my vision, I also believe that there are many more that have personally experienced similar and much, much greater “coincidental” circumstances than mine that will see it and who will recognize His work. Where to start? I guess I’ll just pick it up on that Monday morning twenty five days ago when my car refused to start. Internal combustion is really a simple thing, it’s air and gas mixed together with a spark applied to it. This working knowledge is the basis for troubleshooting any automotive problem. All three things must be present for a car to start. I’m not very mechanically inclined, instead I rely on people who are and on the advice they so generously give me to fix my car. The first idea I heard was that my fuel pump was probably not working, and so after some research into how to replace a fuel pump and shopping around for one, I went about replacing it. So there I was, already into this thing for almost two hundred bucks and not much closer to even knowing what the problem was. It was through the further advice of well intentioned friends and the elimination of fuel as being the problem that my attention was focused on spark. Timing actually, which regulates the combustion process by using a belt driven cam shaft to open and close the valves of the cylinder in sync with the application of the spark and fuel in the cylinder. Whoever came up with the idea for a timing belt must of gotten the idea from God, no doubt inspired by His ability to be the power and the drive that keeps everything in sequence and brings order and harmony to so many different things that work separately and yet together. It was at this point that I fully knew that I was in over my head mechanically, and that I had done everything I personally could to fix my car, that’s when it became “God’s timing belt” problem! What did God have in mind? Was He wanting me to look for a newer car? Was He making some other arrangement’s that would require me to just be patient for a time? I was trusting in that being the case but I didn’t really have any more of a clue! My day to day life and transportation necessities were thankfully being covered by my brother in law who I live with, but here’s where it gets a bit complicated. His car’s transmission had been acting up, it constantly slipped at certain speeds and it had no overdrive, which is related to another previous circumstance that’s very significant. A few weeks ago I was in a library computer lab, I noticed a man who was having trouble inserting his flash drive into the USB port of the computer so I went over and tried to help him. We had a brief encounter and I remember thinking to myself what a nice guy he seemed to be. As I became acquainted with him he shared with me his vision of a ministry he was trying to get going, he wanted to train people to be evangelists and to provide the people of his community with christian based counseling in several area’s, he was also looking for someone who could write blogs for his ministry website…Gee,what a coincidence! I believe that our meeting was by God’s appointment, and that it might never of happened if my bro-n-laws car hadn’t of been acting up! Oh, by the way…the problem with his car miraculously fixed itself a few day’s later when he discovered that his OD switch on the shift lever had somehow been pushed in, which was telling the car to try to shift into a non-functioning OD gear at certain speeds. When he let it out, the car began to function normally (still no overdrive, but without the constant slipping) just as it always had since he’d owned it. He had driven it at least a thousand miles that way and seriously thought that it was going to completely quit on him! I had talked about my car with several people, some gave me advice, others seemed indifferent, and still others offered me actual help! I’ve found that when someone really want’s to help you they’ll always find a way even if that means just somehow letting you know they care. To me, it’s a very big deal to tell someone I love them, I may say it casually but it still means a lot to me. It means I know you at your best and at your worst and that I make no distinction between them in that I’m always going to care for you and about you in all your circumstances. Anyway, back to MY car problem! It was my recently acquainted friend that offered to bring his friend to my house to look at my car. At first he thought it was the belt too, but when we got the cover off it was okay. I’ve got a few plug wires that aren’t in too good of shape so we replaced those, still no good spark. When they opened up the distributor there was a lot of corrosion and the rotor bug was broken, we really thought this would fix it but no, it didn’t. There’s only one component of the electrical system left, the ignition coil, so I ran into town to pick one up. This morning, I took that ignition coil and installed it inside of the distributor cap, it was difficult for me but I was able to figure it out! I twisted the key and VOILA! it started. What can I say? It’s been a process during which I’ve had to give it to God, who then brought some Christian brothers alongside me to do some of the things I couldn’t, but He saved the last piece of the puzzle for me to provide because it was important that it happen that way for my sake. Twenty six days without a car, but being set apart has also been a blessing because in the midst of my lacking God showed me a lot of things, some old, some new, but all of them on His time! As you may know, we had a hum-dinger of an ice storm here where I live in Southeast Mo. 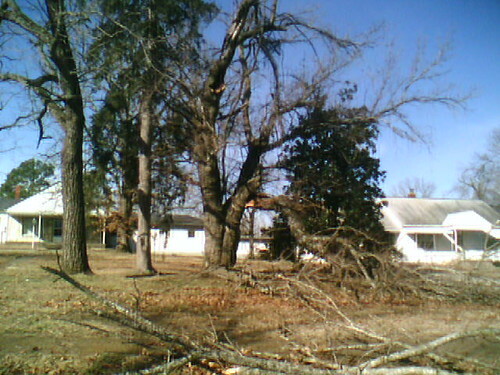 It knocked out power for an extended period of time and left “tree debris” everywhere in our town. The ministerial alliance in our community got together and decided to go out into the community and clean up peoples yards last Saturday, I volunteered! 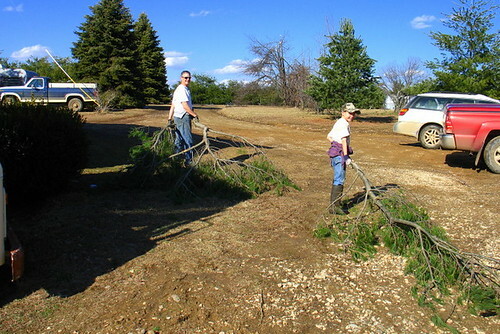 We cleaned up the large limbs, and cut what would be usable as firewood into stove logs. It was a wonderful feeling to help the mostly older people who really appreciated it! 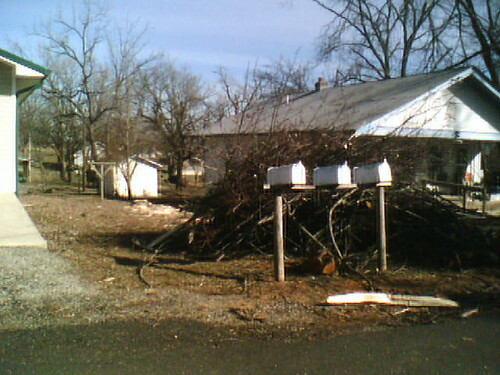 I was talking to one of the pastors who told me about a lady who’s yard was full of limbs. He had offered to clean up her yard but she simply couldn’t accept that anyone would do it for free and was very reluctant to allow it. I told him about a man who we had worked for who had insisted on giving us money, after we had explained that we were “volunteers”…he said “I can’t see you guys doing all of this work for nothing” I told him “we’re not” and that we were happy to do it because we truly believed there was a blessing from the Lord in it for us, and also that we were happy to help him because of what the Lord has already done for us! (set us free from sin). There were some confused expressions on the faces of people, which grew into smiles, and seemed to warm the chilly morning. I can totally relate to people being reluctant or being confused by this “free lunch.” I can remember how I felt when people told me about Gods gift of salvation,and how I thought it sounded too good to be true. I had, like many people been let down by many things I had trusted in before. The memory of the pain was a strong deterrent to me being able to accept Christ or this “gift” I had heard so much about. Our worldly mindset tells us that there are always strings attached to things that seem to be free, so it’s better to pass on things that not only don’t make sense to you but that also might obligate us somehow with the fine print we didn’t understand when we accepted the “free” item. It’s a dark bit of business that our enemy is up to, convincing us that we’re unlovable by anyone… that we are hopelessly condemned to blindly fumble through life searching for the square peg to fit into our square hole, and that we’re failures, or “losers” because we can’t find that “peg” in the things or stuff of this world. I spent the majority of my life doing just that, but it was Gods ACTIONS toward me that opened my eyes and my heart to what He had for me. Not simply the many times he saved me from my own incredibly dangerous stupidity, or delivered me from the addictions I was ensnared by, but mostly for what He did for me on the cross. I grew to love Him after I began to understand how much He loves me! ME! and friends, that is the silver bullet to the werewolf of this world! It is the antidote to what this world has to try and scare me with! whats going to happen with this economy? (God loves me and He’s in control) My job…? Whats going to happen to me and my family if,if,if, same answer! I can face anything that this world can dish out, (even death) how? because of the love of Christ, FOR ME! He stood up in my place, He took my punishment, He paid my debt, and someday, I’ll go to where He is for eternity! I know, too good to be true right? but it IS Because He is the WAY,the TRUTH, and the LIFE! and He’s waiting for YOU! Author altonwoodsPosted on February 19, 2009 July 19, 2009 Categories ice storm, witness oppourtunityTags church, help, ice storm, people2 Comments on Actions,speak louder!